In a just-released NATURE publication that has been featured in NATURE’s News and Views and in MIT’s News, we have shown how to architect analog computation in living cells . Analog computation exploits ‘shades of grey’ in molecular signals versus just ‘on’ and ‘off’ signals in digital computation. It also utilizes functions that already exist within cells to compute rather than re-inventing them with digital logic. Thus, analog computation can be highly efficient in cells [3, 4, 5] and in the brain . This work is founded on our prior work that established the astoundingly detailed similarity between the log-domain equations of chemistry and the log-domain equations of analog electronics  enabling one to easily map back and forth between electronic and chemical circuits [4, 5, 7, 8]. Our molecular circuits can compute logarithms, add, subtract, multiply, divide, and take square roots with less than three genetic parts compared to digital solutions that require 100s of parts and would be difficult to implement within cells . Our circuits also enable fine control of gene expression and wide dynamic range molecular sensing over four orders of magnitude. This work has several applications in biotechnology, medicine, and energy and is pioneering the field of analog synthetic biology and analog systems biology which has thus far mainly been digital and difficult to scale. ANALOG SYNTHETIC BIOLOGY: R. Sarpeshkar, “Analog Synthetic Biology,” Philosophical Transactions of the Royal Society A, 372: 20130110, 2014. ANALOG VERSUS DIGITAL: R. Sarpeshkar, “Analog Versus Digital: Extrapolating from Electronics to Neurobiology,” Neural Computation, Vol. 10, pp. 1601-1638, 1998. 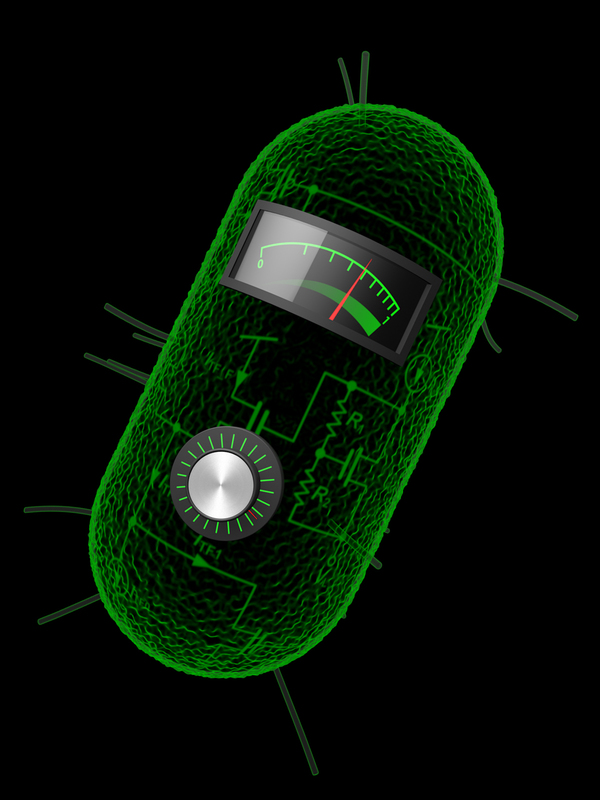 CYTOMORPHIC ELECTRONICS: Cell-inspired electronics for systems and synthetic biology. Chapter 24, pp. 753-786, in R. Sarpeshkar Ultra Low Power Bioelectronics: Fundamentals, Biomedical Applications, and Bio-inspired Systems, Cambridge University Press, Cambridge, February 2010. BACTERIAL GENETIC CIRCUITS: R. Danial, S. S. Woo, L. Turicchia, and R. Sarpeshkar, “Analog Transistor Models of Bacterial Genetic Circuits,” Proceedings of the 2011 IEEE Biological Circuits and Systems (BioCAS) Conference, pp. 333-336, San Diego, CA, November 2011. HYBRID ANALOG-DIGITAL COMPUTATION IN THE BRAIN: R. Hahnloser, R. Sarpeshkar, M. Mahowald, R. Douglas, and S. Seung, ” Digital Selection and Analogue Amplification Coexist in a cortex-inspired silicon circuit,” NATURE, Cover article, Vol. 405, pp. 947-951, 22 June 2000. LOG DOMAIN CIRCUIT MODELS OF CHEMICAL REACTIONS: S. Mandal and R. Sarpeshkar, “Log-Domain Circuit Models of Chemical Reactions,” Proceedings of the IEEE International Symposium on Circuits and Systems (ISCAS), Taipei, Taiwan, May 2009, pp. 2697-2700. CIRCUIT MODELS OF STOCHASTIC GENETIC NETWORKS: S. Mandal and R. Sarpeshkar, “Circuit Models of Stochastic Genetic Networks,” 2009 IEEE Symposium on Biological Circuits and Systems (BioCAS), Beijing, China, pp. 109-112, November 2009.